You will earn 36.37 Reward Points. Earn 1 reward point for every 1 dollar spent. Ideal for Storing items conveniently overhead or above work surfaces. 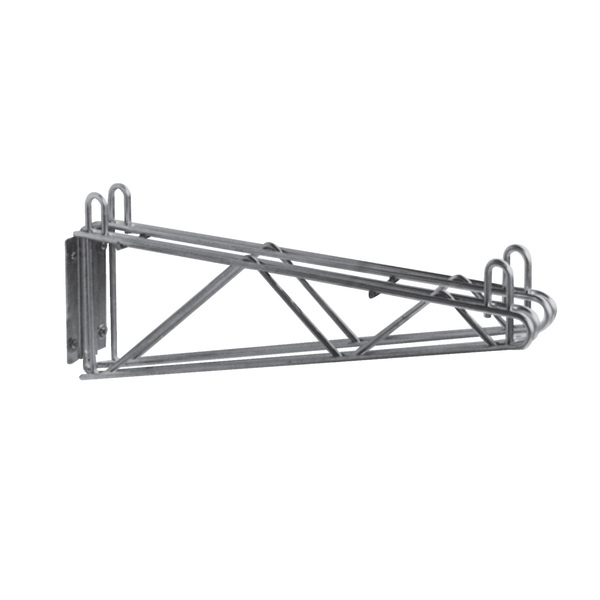 Versatile: Can accommodate Super Erecta wire and solid shelves, Super Erecta Pro, MetroMax Q, and MetroMax i shelves. Note: For MetroMax i shelves, order (1) M9997-4 adapter kit per shelf. Single and Double Supports: Double support used for mounting adjacent shelves; single supports at the ends of the shelving tier. Available in nickel chrome, Metroseal 3 or Type 304 stainless steel. Adjustable: Shelf supports and shelves can be positioned or repositioned on the post in 1" (25mm) increments. For Easy Ordering: “End Unit” and “Mid Unit” models are available to meet a wide range of wall-shelving requirements. Just add shelves. Versatile: Metro’s post-type mounting system can meet your exact needs for wall shelving. Posts and supports are available to hold anything from a single small shelf to many tiers of shelving running continuously along a wall. Fast, Secure Assembly: Post has rolled, circular grooves along its entire height at 1" (25mm) intervals. Tapered, plastic split-sleeve locks around any groove, and matching taper in opening on shelf support provides secure positioning. Conserve Space: Back of shelf is within a fraction of an inch from the wall. Two-Piece: Support is held by mounting plate, which attaches directly to the wall.